Wende’s a motivational firecracker filled with love and devotion for this Club and everyone in it. 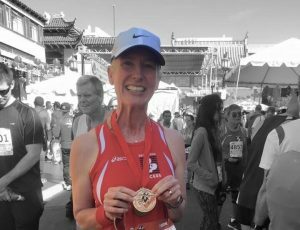 For the past seven years she has been the very epicenter of the 10 Mile Challenge (10MC), pushing, encouraging, and celebrating the many people she has helped evolve into runners. It is with heavy hearts the Pasadena Pacers announce Wende Lee, sparkplug extraordinaire, will step down as Coach. Under her guidance, hundreds of runners have crossed into double digit miles and celebrated their graduation with Wende’s handmade medals. Her tenure as Coach has seen remarkable growth in the 10MC program—consistently adding new members and seeing returning members become mentors in their own right—all to the incredible and indisputable benefit to the Club in its entirety. We are sad to see Wende end this chapter, but know she is not going anywhere. Wende will still be on the sidelines cheering for our Club she holds so dear, and we her. A new coach will be announced soon. In the meantime, please join us on Saturday as we devour tacos and give Wende all the hugs we possibly can.